In this second installment of our new bimonthly feature, Gallery Spotlight, we spoke with Paul Booth, the founder and owner of Last Rites Gallery and its sister tattoo shop, Last Rites Tattoo Theatre. Since getting his first tattoo at the age of 19, Paul Booth became passionate about art but felt alienated by the art world’s rejection of his dark aesthetic preferences. 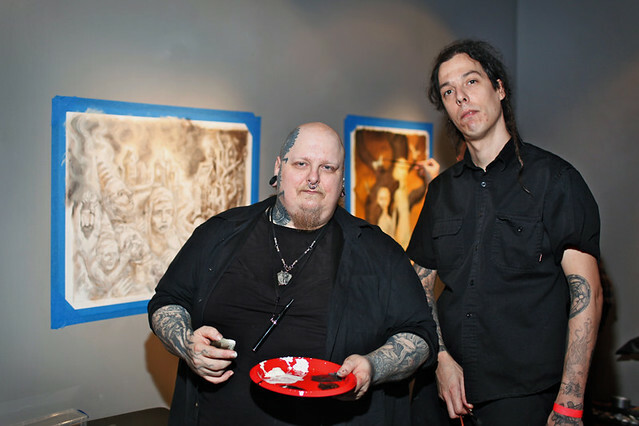 Focused on dark art, Last Rites Gallery became a sanctuary for like-minded artists working in a wide variety of styles. Colin Christian’s doll-like sci-fi sculptures, Yoko d’Holbachie’s fluorescent pop surrealism, Isabel Samaras’s pop culture-inspired paintings and Travis Louie’s monochromatic monster portraits have all found a place on the gallery’s gray walls. Paul Booth took some time to sit down with us and discuss Last Rites’s beginnings, tattooing, his personal art collection and more. Read our conversation below. As I understand, you began your career as a tattoo artist. What lead you to get into the art gallery business? My early beginnings with art date back to high school when I began experimenting and working with painting, drawing and airbrushing. I received my first tattoo at the age of 19 and was so intrigued by the potential for artistry that I was instantly inspired to learn the craft and began apprenticing. As an artist from humble beginnings, I have always had a strong appreciation for fine art, especially outsider art. In 1998, I opened my tattoo studio in New York City and proceeded to hang the artwork of my tattoo artists on the walls. I suppose these were the early beginnings of my dream of having an art gallery. My experience through those years with other art galleries was kind of depressing. There weren’t many art galleries that showed the kind of work that I appreciated, but more importantly, I think it was the way I was generally treated in these galleries that really led me to want to open my own space. The austere and uninviting nature of many galleries made it difficult for me to enjoy the art. I felt a need to create a more friendly art space for people like me, open and accessible, but of course from my dark aesthetic view. How do you see the relationship between tattooing and fine art, Last Rites Gallery and Last Rites Tattoo Theatre? It has come a long way, especially in the last 5 to 10 years. As tattoo art has grown in popularity, it has evolved towards a greater acceptance as an art form. It has been a personal battle for 25 years to open minds and tolerance in this regard, as the process is so different and sometimes intimidating for people. After all, it involves a human canvas that becomes more of a collaboration with the artist. Our aim is not to equate its worth as fine art per se, but to interest [people] in its artistic value. I’ve always made it my mission to engage and exhibit the best talent out there with the Last Rites Tattoo Theatre. The art of tattooing is a complex technique that requires certain expertise and strong ethics, as well as being an artist from the get-go. The mission of Last Rites is the convergence of these two art forms in one space to create a harmonized atmosphere of skill and aesthetic appreciation. This is not only be seen on a day-to-day basis through the exhibitions and open floor plan of the tattoo studio (allowing guests to experience the tattoo artists at work), but during our opening receptions as well. Every opening reception, we invite both tattoo artists and fine artists to collaboratively paint on stage during “Art Fusion,” uniting their talents and creative vision for all to experience. Both the tattoo studio and art gallery offer its visitors the opportunity to marinate in a stimulating environment that is constantly brimming with creativity and inspiration. Our approach exposes the audience to a different art experience where both worlds can be enjoyed and appreciated. 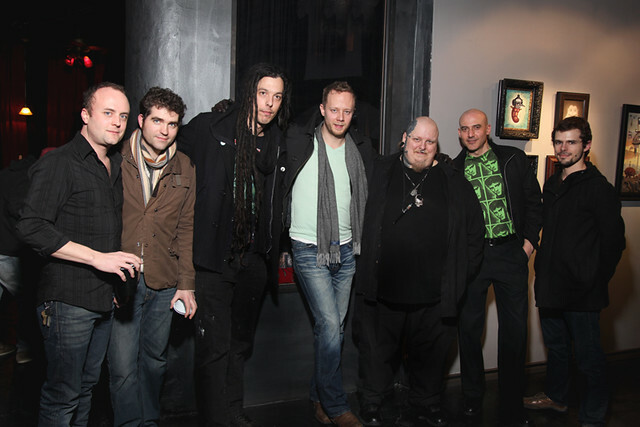 What was going on around the time you founded Last Rites Gallery? What were the first exhibitions like? The first exhibitions were incredibly well received right from the start. I think it was obvious, at the time, that a lot of this talent needed a home in New York City. It brought a whole new crowd to Last Rites as we were previously only known for tattoo art. Utilizing the existing Last Rites brand to grow the gallery really worked in our favor. We were able to introduce exceptional fine art to the tattoo crowd, as well as introducing tattoo art to the fine art crowd. What do you believe sets Last Rites Gallery apart from other galleries? We are obviously not your traditional gallery. There is an alternative vibe that is very apparent in our art and space. It is more of a temple dedicated to art with a concentration on the dark aesthetic. We stand apart with the quintessential “white cube” with our gray walls, evocative lighting and of course, sister tattoo space with its unique interior design that is often perceived as reminiscent of a Gothic church or medieval tomb. We are a very family-oriented gallery that wants our guests to feel at home when they visit. I often hear comments like, “It’s so dark and mysterious, yet warm and inviting at the same time.” Feedback like this always remind me that we’re on the right track. I want visitors and clients to feel like they can connect with us whether they are viewing the art or purchasing it. It should be a comfortable and pleasant experience. As the owner, I think the fact that I am also an artist, plays a significant role in the success of the gallery. I am able to connect with the artists we exhibit on a mutual level, and take care of each one as if taking care of my own. I look at Last Rites Gallery as an outlet for fellow artists to explore the dark side of their work in an environment where they will not be judged but celebrated. I’ve found that many artists really appreciate the opportunity to do so, as they’ve encountered resistance from other venues or even flat out rejection of work not deemed accessible to the public. In my opinion, artists should not be quelled and Last Rites stands to challenge this standard. Last Rites just celebrated its 5th anniversary. How have you seen the gallery evolve? Owning and operating a gallery has been a learning experience from the very start that only continues to be polished as time goes on. Since our start, we’ve overcome various hurdles that have only led to our growth and maturity. We’ve become stronger and more versatile, and proudly have a great team. Thanks to publications like Hi-Fructose, the exposure given to the pop surreal “Low Brow” art form has increased and as a gallery we appreciate and share the same objectives to reveal this brilliant form of artistic expression. Where do you hope it will go in the next 5 years? I want to help build an even stronger appreciation for the art, the artists and the movement around it, and hopefully to create a broader understanding of tattoo art and its relevancy and importance in the contemporary art world. Also, perhaps it’s the artist in me speaking, but I’m really on a mission to help further develop the art community itself. I want to start producing seminars for artists, by the artists, as well as roundtable discussions and even a painting club. I love the creative energy in the air when artists get together and paint. It’s a tremendous inspiration for all of us. Many artists spend most of their time alone when they are painting and I think it’s a good opportunity to come together with their peers in a mutually collaborative environment. 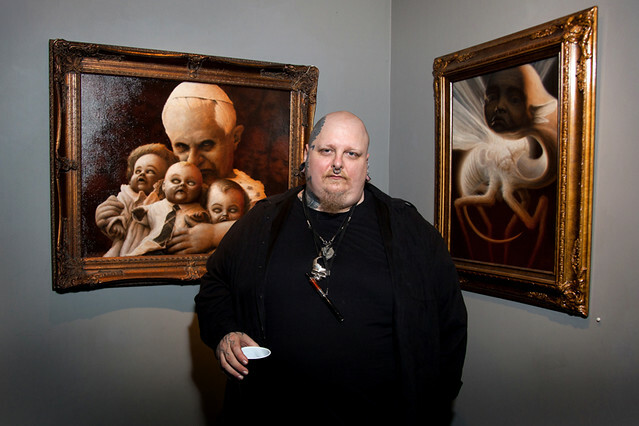 Though Last Rites specializes in macabre and dark art, the exhibitions are quite diverse. Was being pigeon-holed as a dark art gallery ever a concern of yours and what did you do to deal with that? First of all, I tend to think the word “dark” can be a rather generic term. But, honestly, I can’t really find a better one! The idea of dark is dependent upon the artist and what they conceive, as well as the viewer and how they choose to interpret the work. Dark art can entail any variation of palette, theme, subject matter, underlying message and so on. The term “dark art” is subjective. What may be dark for some may not be for others. We have exhibited various artists, and believe they all offer their own unique perspective and interpretation of the term “dark.” Our mission is to bring the artists the opportunity to contrive art from the darkest corners of their minds and hearts. We have exhibited pieces that no other galleries would, due to political, religious or social reasons. We are not out to offend or disturb anybody, but to be a haven for the sake of the art beyond any limited, constructed ideas. As an art space we deeply enjoy when artists that are not dark at all bring us very intense, exhilarating pieces. We want to inspire them to go deep. We all have our demons but nobody struggles in the same way. What inspires you about the contemporary art world today? The possibility of getting more attention towards our niche is very exciting. The elaborate and skillful content that is embodied in this genre deserves more respect and value in the mainstream art world. I look very forward to the future when perhaps there will be a return to “painting” and these forms of art will be just as well received as their contemporaries. What’s in your personal art collection? Any memorable or interesting pieces you’d like to tell us about? A portrait of me done by Shawn Barber now proudly hangs in my tattoo studio. Portrait of the Artist, Paul Booth is executed in Shawn’s loose and abstract, yet realistic style that truly embodies my presence and the atmosphere that I surround myself with. Leech by Chet Zar is one of my favorite paintings. I love Chet’s painting technique and his excellency in producing exquisite textures. Additionally, this piece marks a turning point at Last Rites when we renovated our space and dramatically changed the perception of our gallery. 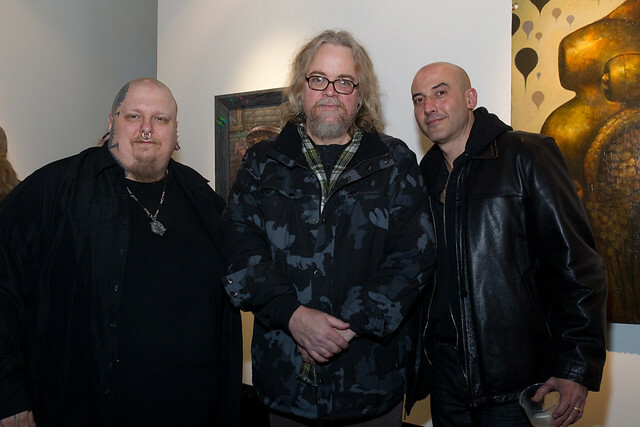 “Faces of Death” was the first show featured in our new space. Haunting the Chapel by Matthew Bone also hangs in my personal collection. I really love this piece by Matthew as I feel he really captured a moment in time that suggests a thought-provoking experience. Grumpy by Michael Mararian is also part of my personal collection. Quite simply, Michael’s piece reminds me of my childhood. Enough said! I really want to take the time to thank my awesome team. Erica Berkowitz, my Director, whose appreciation for the art we show, as well as her attention to detail, is genuine and refreshing. Paola Duran, my Registrar and House Photographer, has a passion for the art that is unsurpassed. Jonathan DeJesus is a fantastic assistant and good sport. And, of course, my mother, Paula Ellis, and my daughter, Tabitha Mancini, are both huge assets to me, even though I hide them in the back office! And, of course, thank you, Hi-Fructose, for supporting us over the years.